A monochromatic colour scheme does not refer simply to the use of black & white. Monochromatic refers to the use of one colour hue – mono – and its shades, tints and tones. This style of decor allows for a greater range of contrasting tones therefore attracting attention, creating focus and even supporting legibility. 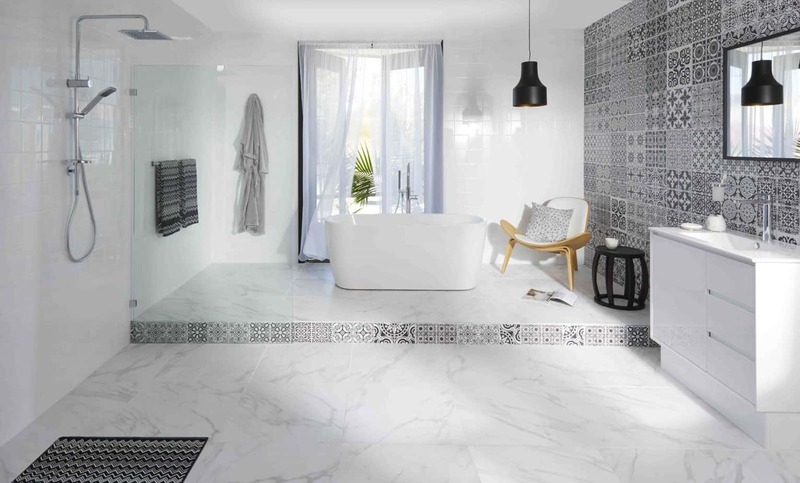 However, black and white are ‘non-colours’ so careful design and colour knowledge minimise spaces looking stark and bland; this combination can look modern, clean, fresh and dynamic. Before I show you a new black and white bathroom designed by Raymor, I want to show some other monochromatic examples. The white bathroom below by Ian Moore Architects is a study in how to successfully use pure white and virtually nothing else. This living room image from cafelighting.com.au shows how black and white can work beautifully together forming a stylish and inviting ambiance. A monochromatic colour scheme can also be extended to your garden whereby you predominantly use plantings in one colour hue. I have seen gardens with all white flowers, for example, and succulents, as in the example below by Personal Garden Coach, can look absolutely stunning. 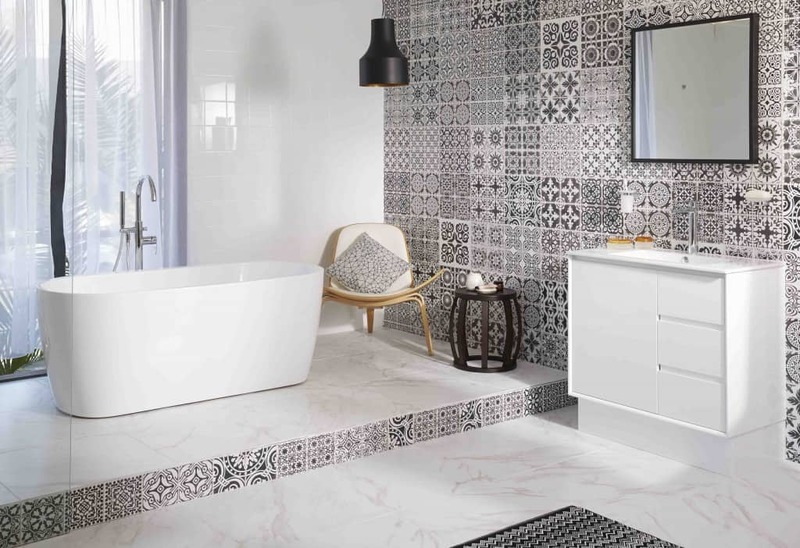 In this article, I’ll show you a new & contemporary black and white bathroom from Raymor. By creating a split-level floor, added interest has been injected highlighted by a row of the same tile-wallpaper use on the feature wall. 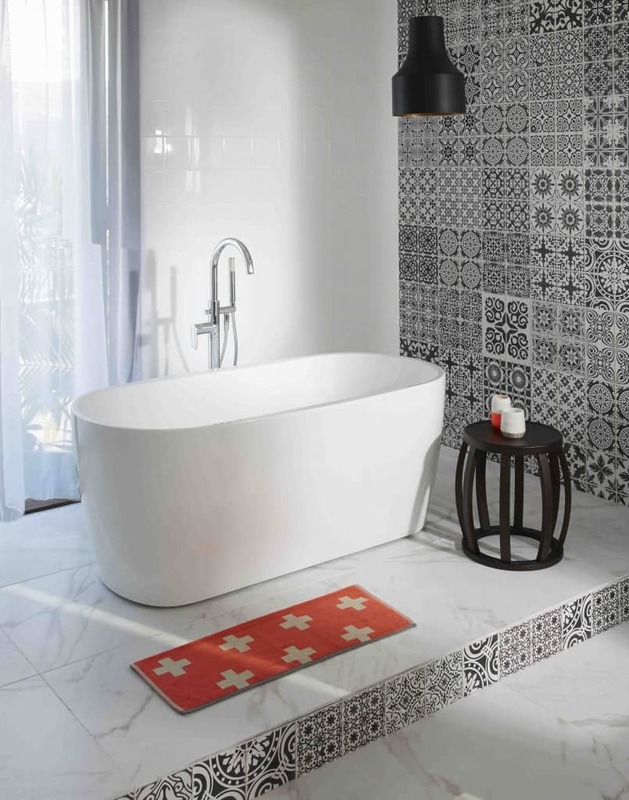 The beautiful curves of the Raymor Aruba freestanding bath (RRP $850) makes a statement without dominating the room. It is perfectly proportioned working stylishly with the Raymor Sturt hand shower (RRP $tba) allowing for dual function – bath and shower. As you can see, it’s easy to add a pop of colour with a colourful bathmat, towel or tealight votives. The vanity has been designed to be deliberately understated so as not to detract from the ‘hero bath’ and monochromatic palette. This floor standing model is 900mm wide with an integrated basin, cupboard and three drawers. Having an uncluttered environment is important in a black and white bathroom so the Raymor Salt vanity (RRP $699) provides ample storage. It also features an optional smart bin and internal LED lightning for the cupboard and drawers. Genius! For a contemporary and stylish black and white bathroom choose chrome accessories. The items used here are from the Raymor Ceduna collection (from RRP $32) featuring softy curved accessories including towel rails, robe hooks, soap dish, toilet tissue holder and toothbrush holder. Accessories are constructed from brass with a bright chrome finish. Available from May 2015 exclusive to Tradelink Plumbing Centres and Northern’s Plumbing Supplies nationally. 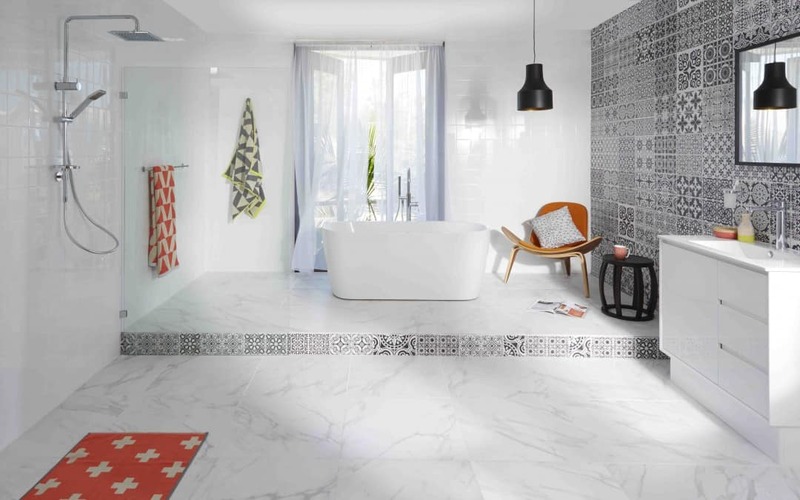 For more great bathroom ideas you might like to read about the new neon textiles from AURA or the AMAZING mosaic-tiled submarine bathroom. And for more help with your colour scheme, see the 10 Commandments of Colour.